With all due respect to the Utah Jazz, the Phoenix Suns are the NBA franchise that’s had produced the best combination of excitement and success without actually hoisting a championship banner. The Suns franchise has been in existence for 42 years. After reaching the postseason just once in their first seven seasons, they’ve reached the postseason 28 times in 35 years, including 18 of the past 21. They’ve advanced past the first round of the playoffs 17 times, have reached the conference finals nine times and have taken part in a pair of outstanding NBA Finals series. The first was in 1976 against Boston Celtics, and in 1993 against Michael Jordan and his two-defending champs. In 1975-76, after a 42-40 regular season, in just their second trip to the postseason, the Suns advanced to the NBA Finals to face the Boston Celtics team, who were led by Hall of Famers Dave Cowens and John Havlicek. While the Celtics, would ultimately prevail in six games, Game 5 of the 1976 Finals is widely considered to be the greatest game in NBA history. In the game, the Suns rallied from a 22-point first half deficit, at Boston Garden, to push the game into overtime. In overtime, Havlicek made what seemed like the game-winning shot, but officials determined there was one second remaining. What followed was one of the smartest moves in NBA history. Suns' SG Paul Westphal called a timeout, with the Suns having none remaining. This resulted in a technical free throw for Boston and the ball at half court for Phoenix. With one second left, Gar Heard made a high-arching, turnaround jumper to force a second overtime. The game would ultimately reach a third, during which Glenn McDonald would come off the end of the Celtics’ bench to score six points and help Boston to a 128–126 win. Nonetheless, there is no shame in losing the greatest game ever by a bucket. Offensive firepower has not been short supply for the Suns throughout the years, as 23 players have averaged 14+ ppg while playing in 200+ games in a Suns’ uniform, with seven- Charlie Scott, Charles Barkley, Gail Goodrich, Amar’e Stoudemire, Tom Chambers, Paul Westphal, Connie Hawkins and Walter Davis- putting up 20+. Additionally, Steve Nash, Kevin Johnson, Shawn Marion, Dennis Johnson, Alvan Adams, Larry Nance, Maurice Lucas, Jason Kidd, Michael Finley, Paul Silas, Dan Majerle and Joe Johnson have all starred for the Suns. Three Hall-of-Famers- Hawkins, DJ and Barkley- have built a significant portion of their resumes in Phoenix. Five years after his retirement, Nash will make this a quartet. From the Greatest Game Ever, to Walter Davis and Larry Nance, KJ-Chambers, KJ-Barkley, J-Kidd, Nash D’Antoni and “Seven Seconds or Less,” finally to Nash, post-D’Antoni-Marion-Stoudemire, the Suns have managed to consistently win games, put plenty of points on the board and excite fans in the process. If the “Clipper Curse” began in 1976, in the Valley of the Sun saw the dawn of a 3+ decade run of prosperity at the same time. With Jason Kidd, who averaged 14.4 ppg, 6.4 rpg, 9.7 apg, 2.1 spg, three First Team All-NBA selections, two straight First Team All-Defensive nods and five straight playoff appearances (although they only advanced past the first round once), finishing a distant third, you know this was a competitive spot. 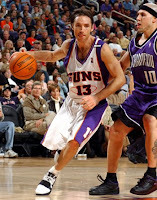 Point guard for the Suns is a fierce battle between Kidd’s predecessor, Kevin Johnson, and the soul of the franchise for the past six seasons, Steve Nash. While KJ (18.7 ppg, 9.5 apg, 49% FG in 683 games) does hold a statistical edge over Nash, the gap narrows considerably if we omit the first two seasons of Nash’s career, during which he averaged 6.4 ppg, 2.8 apg in ~17 minutes as a little-known backup. In the six seasons (466 games) since his return from Dallas, Nash has averaged 17 ppg, 10.9 apg and has an even stronger FG- FT- 3-pt (51- 91- 44.5). He’s averaged less than 10.5 apg once in that span, during which he’s led the league in assists-per-game four times and finished second in 2007-08 with an average of 11.1 apg. Since 2004, Nash has been named an All-Star four times, All-NBA First Team three times and won back-to-back MVP awards in 2004-05 and 2005-06. In doing so, he joined Bill Russell (three in a row), Wilt Chamberlain, Kareem Abdul-Jabbar (two in a row twice), Moses Malone, Larry Bird (three in a row) Magic Johnson, Michael Jordan and Tim Duncan as the only players to win consecutive league MVP awards. LeBron James has achieved the feat since. Nash has led the Suns to the Western Conference Finals three times- spilling pints of blood, both literally and figuratively, in the process- in the past six years. In 51 games in those three postseason runs, Nash has averaged 20.6 ppg and 10.5 apg and has put up at least 17.8 ppg and 10.1 apg in each. In other words, Nash probably won’t even need his Dallas years to secure a Hall of Fame spot. With all of that said, Kevin Johnson, one of the quickest, most talented and underappreciated point guards of his era, is a very worthy adversary. The latest mayor of Sacramento has got a resume that’s not to be overlooked. If it’s not Hall of Fame worthy, it’s at least deserving of strong consideration. In 10+ seasons with the Suns, Kevin Johnson averaged at least 19.7 ppg and 9.3 apg six times, 20- 10 three times and averaged 10+ apg four times. Johnson’s breakout season came in 1988-89, when he averaged 20.4 ppg, 4.2 rpg, 12.2 apg, won the NBA’s Most Improved Player award and was named Second Team All-NBA- but not an All-Star. Over the next two seasons, Johnson averaged 22.3 ppg, 11.8 apg and was named an All-Star each season. He earned a third All-Star selection in 1994. Like Nash, KJ played a big role in three deep playoff runs- the conference finals in 1989 and 1990, the Finals in 1993. Like Nash, he took part in 51 games in those three postseasons, averaging 20.3 ppg and 9.8 apg and put up at least 17.8 ppg and 7.9 apg (both in 1993) in each. Johnson was fantastic in a pair of conference semifinal trips in 1994 and 1995, when he averaged 25.7 ppg and 9.5 apg. I realize that by praising KJ and highlighting the fact that he’s underappreciated but still picking Nash, I continue to underappreciate him. However, given a pair of PG resumes that are so qualified, it helps to take a look at each man’s role on his team and effect on teammates. As great as Kevin Johnson was, he was never the undisputed best player on the Suns (first it was Tom Chambers, then Charles Barkley) and an virtually all of his best teammates- Chambers, Barkley, Xavier McDaniel, Eddie Johnson, Danny Manning, rookie year Michael Finely, Cedric Ceballos and Jeff Hornacek (although he played with a great PG in Utah as well)- excelled in other situations. Nash on the other hand, has been the best player on the Suns and a consistent MVP candidate since 2004. As for his best teammates? It remains to be seen how Nash’s absence will impact Amar’e Stoudemire’s game, but there is no question that he’s elevated the likes of Shawn Marion, Quentin Richardson, Tim Thomas, Leandro Barbosa, Boris Diaw, Channing Frye, James Jones and Raja Bell to heights they’d never before reached and have yet to approach again. This was virtually a dead heat. The statistical similarity between Walter Davis and Paul Westphal is frightening. Davis spent 11 seasons at shooting guard for the Suns, compared with six (five prime years) for Westphal, but on a per game basis, the two are nearly identical. Davis played 30.2 minutes per game. Westphal? 30.6. Davis averaged 20.5 ppg,. Westphal averaged 20.6. Davis shot 52% from the field and 84.1% from the free throw line. Westphal shot 51.6% from the field and 83.2% from the line. Even on 3-pointers, where neither was really any good, Davis hit 28% while Westphal connected on 27.7% of his attempts. On the boards Davis averaged 3.2 rpg, compared with 2.2 for Westphal. This is evens out on assists, where Davis averaged 4.4 apg, compared with 5.2 for Westphal. And steals? Not much difference there, as Davis averaged 1.4 spg and Westphal was good for 1.6 spg. Davis was selected to six All-Star teams in 11 seasons, while Westphal was selected to four in six seasons- averaging 19.8 ppg and 5.3 apg in those All-Star Games- and three times was named All-NBA First Team. A bit of a difference here. Each man was played a key role in two deep playoff runs. Westphal was the backcourt star of the 1976 Finals team that fell to the Celtic to six games and took part in what is considered the greatest game in NBA history. In that Game 5, he scored 25 points and made several game saving plays including maybe the most heads-up play in history, when with a second left in the first OT, he called a timeout that Suns didn’t have. This resulted in a technical foul and a free throw for the Celtics, giving them a 112-110 lead, However, it also allowed the Suns to advance the ball to midcourt, setting up Gar Heard’s amazing turnaround that sent the game to another period. For that postseason, Westphal averaged 21.1 ppg, 2.5 rpg and 5.1 apg in 19 games. Davis was the star of Phoenix’s 1984 conference finalist that took the Lakers to six games. In 17 postseason games in 1984, Davis averaged 24.9 ppg, 2.7 rpg and 6.4 apg. The duo has the other deep playoff run in common, as both men were members of the Suns’ 1979 conference finalist that lost to the eventual world champion Sonics in seven games. In 15 postseason games in 1979, Westphal averaged 22.4 ppg, 2.2 rpg and 4.3 apg, while Walter Davis was good for 22.1- 4.6- 5.3. With nothing but respect for Walter Davis, one of the most graceful and underappreciated scorers of the 1980s, as well as the Suns’ all-time leading scorer (15,666 points), this spot had to go to Westphal. While his time with the Suns was significantly shorter than Davis’, Westphal’s performance reached a higher peak, he was a strong performer for the first Finals team in franchise history, and his fantastic performance in Game 5 in 1976 is one of the franchise’s signature moments. Also deserving a mention here is Charlie Scott, whose 25 ppg ranks as the best in Suns’ history. Unfortunately he accomplished this for a trio of sub-.500 teams, and simply was not with the franchise long enough to challenge either Westphal or Davis for this spot. For anyone wondering why there’s been no mention of Dennis Johnson… sit tight. This will be rectified in the coming days. Based on his recent work, it’s easy to dismiss Shawn Marion as merely a creation of Steve Nash and Mike D’Antoni. 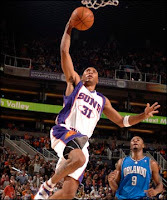 However, while playing for the Phoenix Suns- and that is what we’re doing here- Shawn Marion was the NBA’s best sub-6’9” rebounder and posted the NBA’s eighth best rebounding average (10.4 rpg) from 2000- 2008. Additionally, Marion is one of the best individual defenders in the NBA, both on and off the ball, as a help defender and playing passing lanes. And then there were the fast breaks. While it’s debatable exactly how much of Marion’s exceptional play on the wings was made possible by Steve Nash, it’s worth noting that no one has thrived while running the break alongside Nash the way that Marion did. Shawn Marion was James Worthy to Steve Nash’s Magic. In eight full seasons in Phoenix, Marion earned four All-Star selections and a pair of All-NBA Third Team selections. He averaged 19+ ppg for five straight seasons (2000-01 through 2005-06) and at least 9.3 rpg for seven consecutive seasons, beginning with his second NBA season. He reached the peak of his powers in the two seasons from 2004- 2006, when he averaged 20.6 ppg, 11.6 rpg, 2 spg, 1.6 bpg (Nash wasn’t playing defense and grabbing his rebounds for him too, was he?) and shot over 50% from the field and 82% from the free throw line. Marion played in the postseason five times with the Suns, three times playing in 11+ playoff games (2005-07) and twice (2005 and 2006) reaching the conference finals. In his three lengthiest playoff runs (46 total games), Marion averaged 18.6 ppg, 11.4 rpg, 1.6 spg and 1.5 bpg. He was at his best in the 2006 playoffs, when the Suns knocked off both Los Angeles teams in a pair of grueling seven-games series before falling to the Dallas Mavericks in six games in the conference finals. Marion was fantastic in those 20 games, averaging 20.4 ppg, 11.7 rpg and 1.9 spg. Among forwards in Suns’ history, Marion is the all-time leader in games played (660), points (12,134), FG attempted (10,136) and made (4,879), 3-pointers attempted (1,905) and made (652), offensive rebounds (1,689), defensive rebounds (4,928), total rebounds (6,617) and steals (1,244; no one’s even halfway there). In franchise history Marion ranks in the top five in games played (5th) and points (4th), is in the top three in the remaining categories above, and is the franchise’s all-time leader in defensive rebounds. A very honorable mention for the man whose picture I’d expected to be atop this page, Brooklyn-born and Rucker-trained Connie Hawkins. Had the league- through the actions of its own commissioner at the time- not been robbed of his best years, Hawkins would occupy a far more prominent place in NBA history. As things stand, he’s remembered as one of New York’s best-ever playground stars, who bounced around in his early 20s and dominated for two seasons in the ABA before being allowed to join the NBA toward the end of his prime. Though it’s been told before, Hawkins’ story cannot be retold often enough. After starring at Boys high School in Brooklyn and at Rucker Park, basketball’s urban cathedral, Connie Hawkins accepted a scholarship to the University of Iowa. However during his freshman year, he was wrongly implicated in a point-shaving scandal that was traced back to New York. While he knew some of the individuals involved from his youth, Hawkins had neither knowledge of nor involvement in the scheme. Although he vehemently maintained his innocence and never admitted any wrongdoing, Hawkins was expelled from Iowa, unable to secure a scholarship from another school and blacklisted from professional basketball. He spent one season with the ABL’s the Pittsburgh Rens, with whom he averaged 27.5 ppg, 13.5 rpg and was named league MVP. Following the ABL’s downfall, Hawkins spent three years with the Harlem Globetrotters. During this time, he filed a lawsuit claiming the NBA had unfairly banned him, and that there was no evidence linking him to point-shaving. It was at this time, in 1967, that Hawkins joined a new league- the ABA. Hawkins joined the Pittsburgh Pipers in the league’s inaugural season, and had one of the best seasons in the brief history of the ABA. He averaged a league-best 26.8 ppg, 13.5 rpg and 4.6 apg, was named an All-Star, won the league MVP and led the Pipers to a 54-24 regular-season record. In the postseason he was good for 29.9 ppg and 12.9 rpg as he led the Pipers to the 1968 ABA championship and won the playoff MVP award. After the season, Pipers moved to Minnesota, where Hawkins averaged an awesome 30.2 ppg and 11.4 rpg in 47 games, in an injury-plagued 1968-69 season. After the season, Hawkins’ suit with the NBA was settled, and at age 27 his rights were assigned to the expansion Phoenix Suns. Not bad, huh? So that’s all stuff that we can’t consider for this spot. Although he’s become synonymous with Suns’ franchise, Connie Hawkins spent just four seasons with the Suns, one of them great, two very good and one solid. He was named an All-Star four times, All-NBA First Team once and was a part of the only playoff team in the Suns’ first seven years. Hawkins’ best season in Phoenix was his first, 1969–70, when he averaged 24.6 ppg, 10.4 rpg, 4.8 apg and was named both an All-Star and to the All-NBA First Team. His outstanding season was only good enough to lead the Suns to a 39-43 regular season record, but this was enough to earn them a playoff spot. In the playoffs, the Suns squared off against the West-Baylor-Wilt-led Lakers, and managed to push the eventual conference champs to seven games, with Hawkins leading the way, averaging 25 ppg, 14 rpg and 7 apg. Hawkins put up 21 ppg and 8.7 rpg over the next two seasons and earned two more All-Star selections, though the Suns missed the playoffs each season- ironically with 47 and 48 wins, respectively. Hawkins’ last season with the Suns was 1972-73. That season, he was selected to a fourth straight All-Star team despite averaging a solid but unspectacular 16.1 ppg and 8.5 rpg. He was traded to the Lakers eight games into the 1973-74. Without a doubt, Connie Hawkins’ total body of work through 1973 would have been enough to trump Shawn Marion’s, but based solely on his time with the Phoenix Suns, the Hawk is an excellent player that falls short. Also deserving a mention here is Paul Silas. Silas began his three-year run in Phoenix the same season that Hawkins began his, 1969-70. 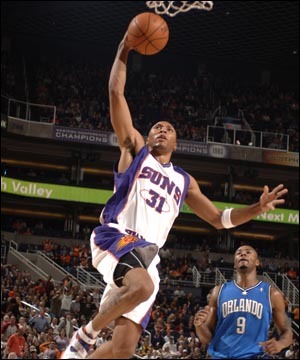 Silas was a monster on the boards for the Suns, averaging between 11.7 and 12.5 rpg each season he was with the team. His third, 1971-72, was Silas’ best, as he averaged 17.5 ppg (12.5 the previous two seasons), 11.9 rpg, was named an All-Star and was selected to the All-Defensive Second Team for the second consecutive year. In 239 games with the Suns, Silas averaged 14.1 ppg and franchise-best 12.1 rpg. From 1979 through 1982, there was the well-traveled but extremely talented Truck Robinson, who averaged 18.1 ppg and 9.5 rpg and was selected as an All-Star in 1981. Robinson averaged at least 17- 9 in each of his three full seasons with the Suns. Following the 1981–82 season, he was traded to the Knicks for Maurice Lucas. Lucas would step right into Robinson’s place, averaging 15.4 ppg and 9.7 rpg in his own three-year stint with the Suns. His first season in Phoenix, 1982-83, was his best statistically, as Lucas put up 16.5 ppg and 10.4 rpg and was selected to the All-Star team. The following season he averaged 15.9 ppg and 9.7 rpg in 75 regular season games and 17.4 ppg and 9.9 rpg in 17 postseason games, as the Suns reached the Western Conference Finals. Meanwhile, there was a young Larry Nance, who spent the first six and a half seasons of his excellent career (starting in 1981-82) with the Suns. After his rookie season (just 6.6 ppg and 3.2 rpg), Nance never averaged worse than 16.7- 8.3 for the Suns. From 1984-85 through 1986-87, Nance enjoyed a three-year stretch in which he averaged at least 19.9 ppg and 8.5 rpg. He was named an All-Star in 1985, and produced the best statistical season of his career in 1986-87, when averaged 22.5 ppg, 8.7 rpg and 2.2 bpg in 69 games. In the Suns’ aforementioned run to the 1984 conference finals, Nance averaged 16.9 ppg, 8.7 rpg and 2 bpg. In the late 1980s and early 1990s, after this talented trio had cleared out, Tom Chambers starred for the Suns. He averaged 20.6 ppg and 6.6 rpg five seasons and Chambers enjoyed the best seasons of his career (25.7 ppg and 8.4 rpg in 1988-89; 27.2- 7 in 1989-90) with the Suns. He was named Second Team All-NBA and an All-Star both years. He was also named an All-Star in 1990-91, when he averaged 19.9 ppg and 6.4 rpg. The Suns reached the conference finals in each of Chambers’ first two seasons, as he averaged a combined ~24 ppg and ~9 rpg in those two postseasons. Next up we have one of the most athletic 6’10” players ever and the most recent occupant of this spot, Amar’e Stoudemire. In seven “full” seasons (includes seasons of 53 and 55 games), Amar’e averaged 21.4 ppg, 8.9 rpg and 1.4 bpg, was named an All-Star five times (16.8- 7.8 All-Star averages; 29 pts in 2007) and First Team All-NBA in 2006-07. Twice he was good for 25+ ppg and three times he averaged at least 9 rpg. Despite having the potential to be one of the greatest and most athletic big men of his generation, Stoudemire’s been constantly struggled with injuries (not his fault, but doesn’t help his resume), has always been a liability on defense (watch him defend the pick and roll. It’s a debacle!) and has not helped the Suns get past the conference finals. Given his competition, Stoudemire’s body of work on Phoenix simply doesn’t justify giving him the top spot here. That leaves just one man as the greatest power forward in Phoenix Suns’ history- Charles Barkley. Sir Charles spent just four seasons in Phoenix, but from both an individual and a team perspective, accomplished things that had never been done in the franchise’s history. Prior to Steve Nash’s return from Dallas, Barkley was the greatest player in franchise history. In his first season with the team, Barkley enjoyed one of his best seasons (25.6 ppg, 12.2 rpg, 5.1 apg) as he led the Suns to a franchise-record 62 regular season wins. That year, he was named an All-Star, selected to the All-NBA First Teams and became the first player in franchise history to win the league MVP award. 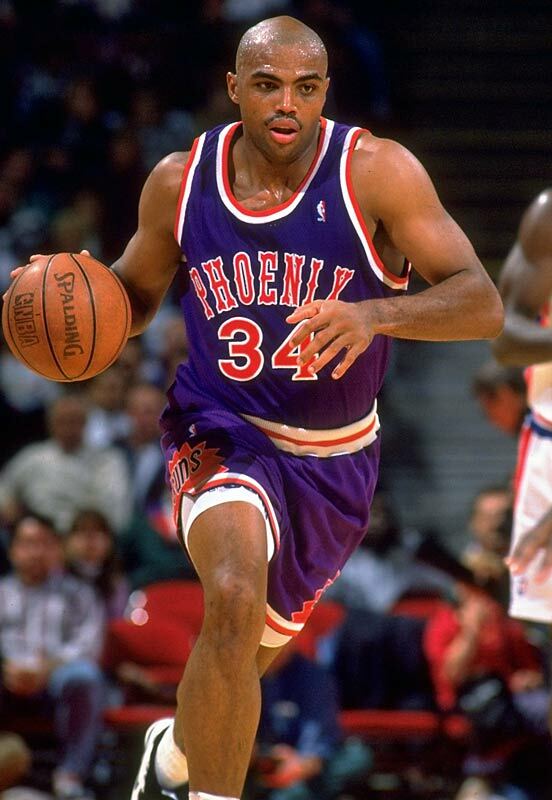 He was even more of a monster in the postseason, averaging 26.6 ppg, 13.6 rpg and 4.3 apg in leading the Suns closer to an NBA title than they’d ever been (technically this is true; both his 1993 team and the 1976 team lost in six games, but Barkley’s crew was +26 on point differential). Over the next three seasons, Barkley averaged no worse than 21.6 ppg, 11.6 rpg and 3.7 apg, earned a pair of All-Star and Second Team All-NBA selections. In the two seasons after falling to Michael Jordan’s Bulls in 1993, Barkley’s Suns took the eventual champion Houston Rockets to seven hard-fought games in the conference semifinals, falling by just one point in 1995. Barkely is the Suns’ all-time leader in defensive rebounds per game (8.4) and ranks second in franchise history in scoring average (23.4 ppg; first among forwards), offensive rebounds per game (a fantastic 3.1) and rebounding average (11.5 rpg). First, an honorable mention to Neal Walk, who joined the Suns in their second season, 1969-70. Walk had a solid run with the franchise (14.7 ppg, 8.9 rpg in 408 games), missing just two games in five seasons. His run in Phoenix included a pair of double-double campaigns in 1972-73 (20.2 ppg, 12.4 rpg) and 1973-74 (16.8- 10.2). With that said, while Neal Walk was a nice player, it’s ridiculous to even have a conversation about this spot. 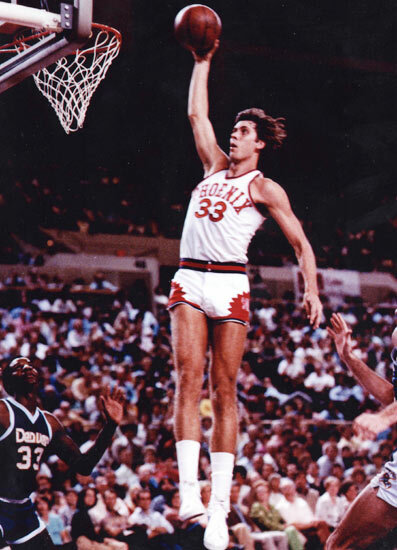 Although his numbers don’t jump out at you, Alvan Adams is with out a doubt the Suns’ all-time center. Adams spent his entire 13-year career with the Suns, playing nearly 1,000 games. He ranks first in franchise history in games played (988), minutes (27,203), rebounds (6,937) and steals (1,289). He ranks second in points (13,910), third in assists (4,012) and fourth in blocked shots (808, though in fairness, this comes out to only .82 bpg). While he produced a long run of solid play, Adams peaked early. He averaged at least 17.8 ppg and 9.1 rpg in three of his first four seasons and was good for at least 14.2 ppg and 6.9 rpg in each of his first eight. Adams’ best NBA season was his first, 1975-76. That season, he averaged 19 ppg, 9.1 rpg, 5.6 apg, 1.5 spg and 1.5 bpg, won the Rookie of the Year award and earned the only All-Star selection of his career. He was also excellent in the postseason, averaging 17.1 ppg and 10 rpg as the Suns made a Cinderella run to the 1976 Finals. On February 22, 1977, Adams recorded one of the greatest triple-doubles in NBA history, when he scored 47 points, grabbed 18 rebounds and handed out 12 assists against the Buffalo Braves. 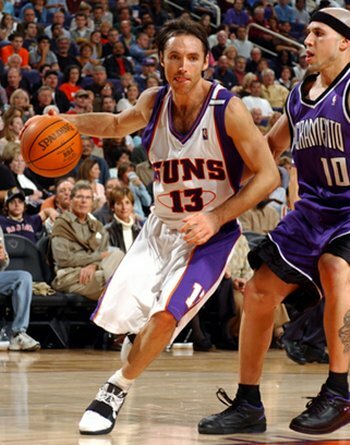 One final fact about Alvan Adams: while his #33 has been retired by the Suns, he offered it to Grant Hill when Hill signed with the Suns as a free agent in 2007. Maybe it’s because Hill is really good guy himself, but this struck me as an exceptionally cool move.